The Space Autonomous Mission for Swarming and Geolocation with Nano-satellites (SAMSON), a new satellite mission, led by the Technion and supported by the Israeli space industries, is featured in the press (in Maariv, TheMarker and Haaretz). 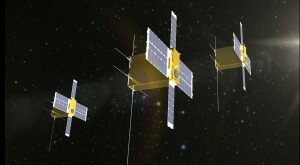 The project consists of launching a satellites cluster, the first ever in space history. The satellites will function and communicate autonomously, manage a coordinated cluster without any instructions from earth, and will be operated by an operating system that is developed at Rafael and the Technion especially for the project and every satellite will carry an atomic clock. The first goal of the project is to prove the possibility of a long-term (one year at least) autonomous cluster flight of multiple satellites. Another goal is to check the possibility of determining the position of a cooperative terrestrial emitter, by analyzing the data received simultaneously from all three satellites. This new technology can be used, for example, to locate people in distress.